Lena Ravenelle and Darwin Gibbons work with E. coli cells. Delaware Technical Community College students learned about gene editing using molecular scissors called CRISPR, and they applied their skills in the lab at the Stanton campus in Newark. It’s an effort to introduce students to rapidly changing technology that can pave the way for how new cancer therapies are developed. Student Darwin Gibbons says the courses were helpful in propelling him towards a career in forensics. He says one of the biggest takeaways is ethical concerns that revolve around using CRISPR. “It’s not very hard to do, but to understand if you do gene editing on somebody that you can actually mess with their germline and that can mess with their offspring – there can be big hazards kind of like in the future with this," Gibbons said. Conversations about a gene editing curriculum started after Dr. Eric Kmiec, the director of Christiana Care’s Gene Editing Institute, found CRISPR prototypes sitting in a freezer, and wanted to use them as a teaching tool. Christiana Care provided Delaware Tech with the technology to bring gene editing into the classroom. The curriculum launched last fall after Delaware Tech and Christiana received a $1 million grant from the National Science Foundation. This past year, 17 students enrolled in the fall genetics course, and 15 enrolled in the spring 2018 molecular biology course – both at the Stanton campus. Thirteen students took the courses at Delaware Tech’s Owens campus. Biology instructor John McDowell taught the courses and says students learned everything from how to use CRISPR to edit the genes in yeast, to editing DNA outside of bacteria and putting it back in the bacteria to see the changes. 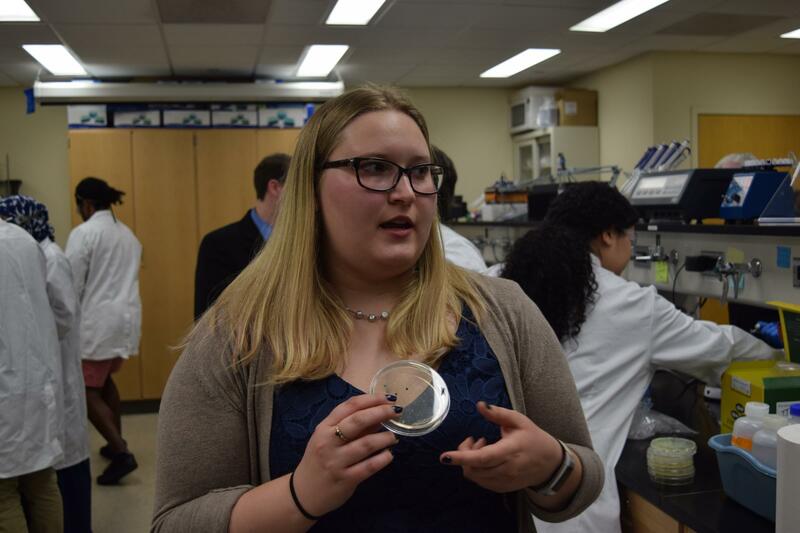 Delaware Tech Science Educator Kristen Pisarcik talks about editing DNA outside of a cell and putting it back into bacteria to see if bacteria change color from blue to white. “All the skills we’re teaching as part of the lab really relate to skills they need to have as a technician or as laboratory workers in the field,” McDowell said. As for the curriculum, "I think it’s been hugely successful,” he said. For students looking for careers in gene editing, there aren’t many in-state employers other than Christiana Care’s Gene Editing Institute. Kmiec says the institute employs 15 people, and they’re ready to add two or three more. According to the Delaware Department of Labor, there isn’t a classification for the gene editing industry, so it’s difficult to track what other companies and people statewide are doing work related to this field. Kmiec says a lot of students can use the tools they’ve learned to help advance their education. Delaware Tech plans to offer both the genetics and molecular biology courses again next year. McDowell says they may include new material from Christiana Care, as scientists’ work continues to evolve. Lung cancer is the leading cause of cancer deaths in Delaware and nationwide, which is why doctors at Christiana Care Health System are working towards new approaches to catch it in early stages and improve treatments. Christiana Care scientists have found a way to use molecular scissors called CRISPR to edit genes outside of a cell, which could allow them to recreate genetic mutations in a tumor sample and figure out more targeted treatments for patients. Scientists have figured out how to edit genes to prevent genetic disorders in embryos, and the discovery is simultaneously receiving applause and skepticism from Delaware scientists. Delaware Public Media science reporter Katie Peikes talks with Dr. Eric Kmiec from Christiana Care's Gene Editing Institute about genetically editing human embryos, and what kind of work Christiana Care is doing with gene editing.